Had a nice, busy Cool Jerk-related day yesterday. Comic-Con is barely a week in the rear view mirror, but that doesn’t mean I rest on my laurels until the next convention or store signing. Oh no. I loaded up the car and headed up to Los Angeles. Mission: Bimboozled. OK. My first Bimboozled-related stop was Comics Toons and Toys in Tustin. The owner — Matt Powers — and his #1 henchman Ken Rolow have long been allies and advocates of Cool Jerk. In fact, my second-ever store signing (in Dec. 2005) was there. Their inventory showed Hodabeast only, and Matt was kind enough to add Chickadoowa, Bimboozled and Doc Splatter Ominous Omnibus to their store. Yay! My next stop was in Pasadena. I’d been to Comics Factory a few times, the most recent time I spotted a copy of Hodabeast on their shelf. So I introduced myself to George (the owner) and let him know I have three more books! He took a stack off my hands, cut me a check and we wished each other a good day. 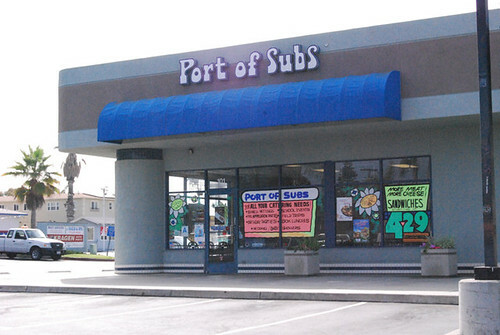 Like a moth to a flame, I can’t get within a 20-mile radius of Burbank without stopping in to Porto’s Bakery for some lunch (potato ball sandwich) and to one of my all-time favorite comic shops: House of Secrets. 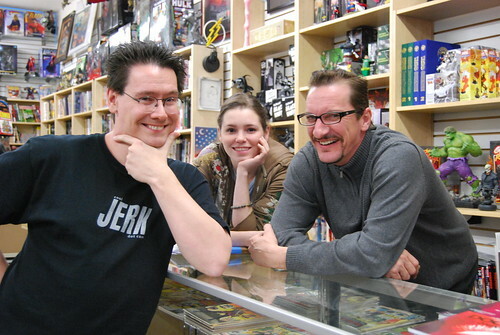 Erik and Paul have been staunch supporters of Cool Jerk for years, and they hosted a store signing for me in January. Their clientele are loyal and friendly. All Erik needed to see was one copy of Bimboozled and nothing need be said by me, as he just said “let’s do it.” And now House of Secrets has the full Cool Jerk library. It wasn’t the smartest plan to drop in on comics shops on a Wednesday, aka New Comics Day. The busiest day of the week. But it was necessary, because my NEXT stop was The Comic Bug in Manhattan Beach… and thus the true reason for the trip north. Unlike the other shops I visited, this one wasn’t about Cool Jerk. It was about JustJenn. Darlene’s and my friend Jenn was having a store signing (is that the right term? ), selling her stationery, pads, buttons, badges, posters and related handmade design collectibles and ephemera. And cupcakes. Ohh-h-h-h. The cupcakes. 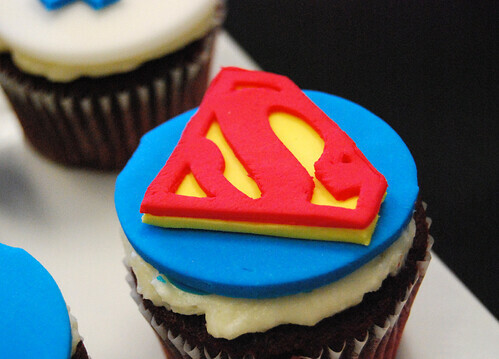 Besides being an outstanding food blogger and graphic designer, Jenn also bakes a mean cupcake. 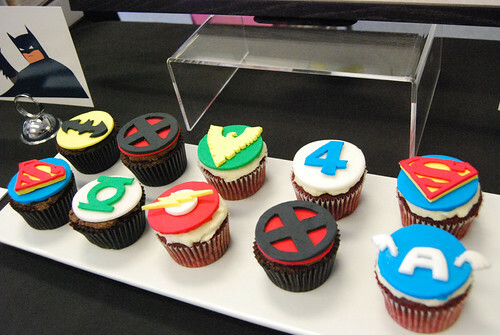 The ones she was selling (or giving away as samples, or with purchase) were meticulously decorated with some of the more popular Marvel or DC superhero logos. That Superman logo was a jaw-dropper. Jenn already blogged about the event, so I won’t steal her thunder. But from my side of the table, it was a lot of fun. I saw a bunch of friends, most of whom are on Twitter (@sarahkuhn, @fakejeffchen, @foodlibrarian, @waffles) and met Jenn’s friend Cheryl (who bought a set of Cool Jerk books from me curbside at Jenn’s suggestion) and Jenn’s grandmother, aka The O.G. For 12 hours yesterday, it was like a bonus sixth day of Comic-Con. Sure I sold a bunch of books, but I also bought more comics than I did during comic-con. I also met friends, made new ones, helped support a pal. Good day. Book signing — Don’t keep this a SECRET! Take out your Sharpie and mark your calendars, Los Angelenos! I’ll be signing at House of Secrets on Wednesday, January 20 from 11 am until the store closes at 8:30 pm. Owners Erik and Paul were gracious enough to give me the green light to stink up their store for a day, allowing me to sell my full library of Cool Jerk and Doc Splatter books IN PERSON. 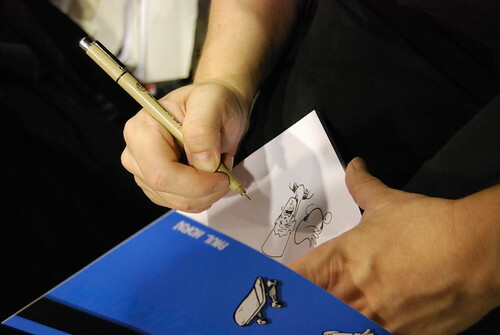 What better way to meet a comic creator than to drop some folding money and get a book (or three) personalized to you with a signature and sketch? House of Secrets is located at 1930 Olive Ave. in beautiful Burbank (home of Bob Hope and the potato ball). See you there!